If you’ve ever looked at your knuckles and thought they were too darned pink, you can remedy that with a drive on the Apache Trail. The rangy, historic road exposes a dramatic combination of desert, mountains and lakes, while the twisting descent down Fish Creek Hill will have even confident drivers clutching the steering wheel in a white-knuckled panic grip. A winding backcountry drive that delivers stunning scenery and for a few minutes, scares the bejeebers out of you—tell me that doesn’t sound like a fantastic day trip. President Theodore Roosevelt sure thought so. He called the 42-mile road “one of the most spectacular, best-worth-seeing sights in the world.” And I’m with Teddy on this one. The Apache Trail may be the most scenic drive in Arizona and it’s practically on Scottsdale’s doorstep. It begins in Apache Junction, some 30 miles east of town. Officially known as Arizona 88, the Apache Trail angles north from its intersection with US 60. The road rambles into a landscape so wild and unexpected it could have been designed by Dr. Seuss after a tequila bender. The Apache Trail travels along the northern flank of the ragged, jagged Superstition Mountains. This is a land of legends and ghosts, of murdered men and hidden gold. The Superstitions are a sudden and savage wall of dark stone rising from the desert floor. If your notion of mountains involves snow-capped peaks, fragrant forests and sweeping meadows, the Supes will slap the wide-eyed innocence right off your face. They’re part fortress, part maze—the hulking skeletons of ancient volcanoes. Eons of erosion have gnawed the mountains into the fierce range of soaring cliffs and slashing canyons punctuated by welded tuff hoodoos we see today. You’ll find a cluster of worthy stops right away, including the Superstition Mountain Museum. This is a good place to learn about Jacob Waltz, the German prospector known as the “Dutchman” who allegedly found a rich gold vein in the Superstitions and killed anyone who ventured too close. Waltz died in 1891 and treasure hunters have been seeking the elusive mine ever since. Of course, geologists say no mine exists because the volcanic bones of the mighty Supes are an unlikely place for gold to occur. But puny science is no match for rumors of gold. The museum contains several “maps” to the Lost Dutchman Mine so if you plan to recover the treasure this is a good place to start. Just up the road, Goldfield Ghost Town includes mine tours, a narrow gauge railroad, gunfights, restaurants and shops. 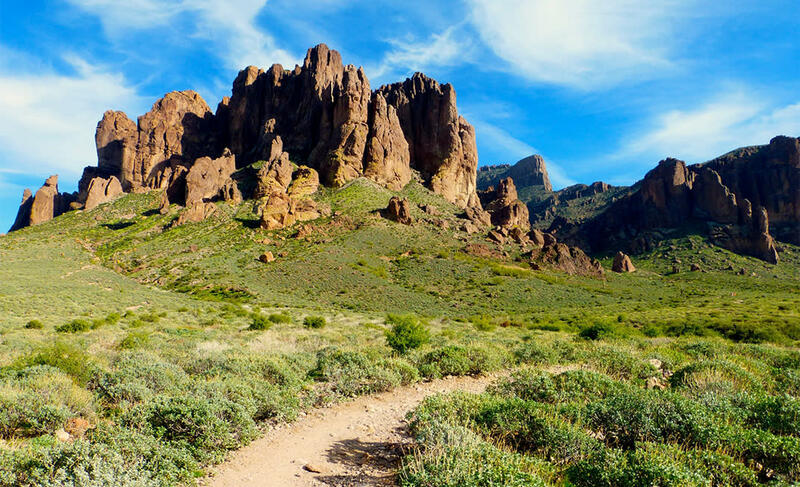 Lost Dutchman State Park features a network of beautiful trails crisscrossing green slopes that often blaze with color in spring. The park is one of my favorite places to search for wildflowers in February and March. Beyond the park, the road curves into a jumble of chaotic hills and sharp-angled ridges before reaching Canyon Lake. The cliff-lined waterway is one of a chain of lakes formed by dams that corral the once volatile Salt River. Past Canyon Lake, the Apache Trail rolls through the tiny burg of Tortilla Flat, a former stage stop. Grab a burger or ice cream at this rickety outpost. This will be your last contact with civilization for a while. The pavement plays out soon after you leave the Flat but the well-graded dirt is generally no problem for sedans. A rest area sits atop Fish Creek Hill with views of colorful gorges and jumbled mountains. The road plunges steeply down Fish Creek Hill, dropping 1,500 feet in three miles. A seemingly impossible design, the route is one-lane with pullouts and curls around the mountain like a stripe on a barber pole. Remember that traffic crawling uphill has the right of way. The rest of the drive is beautiful and less terrifying. The road rambles alongside Fish Creek, beneath a canopy of cottonwood trees. Saguaros dot the slopes above. Soon you’re skirting the shoreline of Apache Lake, with water practically lapping against the shoulder of the road. As you reach Roosevelt Dam, the pavement resumes but this is the official end of the Apache Trail. The road was built from 1903-05 to accommodate construction of the dam. Instead of retracing your route, I recommend making a loop by turning southeast on Arizona 188 to Globe, then west on US 60 back to town. 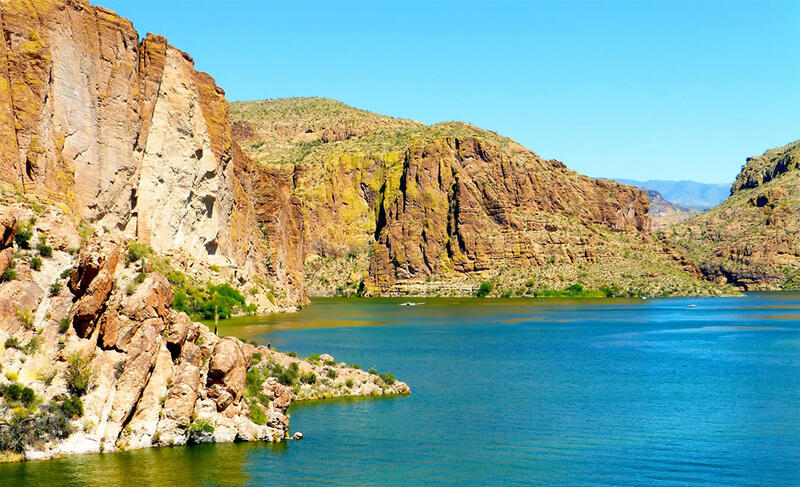 Along the way you’ll enjoy more amazing scenery and worthwhile attractions like Tonto National Monument, two prehistoric cliff dwellings built by the Salado people in the 14th century. You’ll also travel through the historic mining towns of Globe, Miami and Superior and pass the enchanted Boyce Thompson Arboretum where a sea of cactus from around the world laps at the base of Picketpost Mountain. Now that is a road trip!